Luxury and versatility meet in Aspinal of London's Reversible Leather Belt. Available in a choice of brown and tan or black and navy, the dual tone colour palette allows you to effortlessly tailor your belt to your outfit, accented by the brushed gun metal brass buckle. No detail is overlooked; each belt is handmade from the highest quality smooth Italian calf leather and subtly embossed at the tip with our signature shield logo. Convenient and utterly refined, it is a modern wardrobe essential. 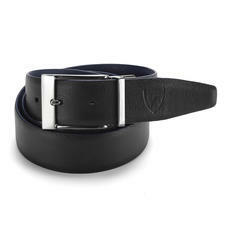 Enjoy the convenience of two belts in one with an Aspinal men's reversible leather belt. Handmade from the finest smooth Italian calf leather and full grain nubuck, this extremely versatile belt features a brushed gun metal brass reversible buckle with the tip of the belt discreetly embossed with the Aspinal signature shield. 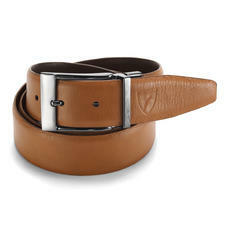 The dual colour combination make this reversible leather belt a wardrobe staple for the modern gentleman.